The Groves Award for outstanding leadership and vision in the promotion of Transect-based planning is given jointly by the Transect Codes Council and the Congress for the New Urbanism. Any public official—elected or staff, including planning departments—is eligible for the Award. Nominations are welcome from any public- or private-sector planning professional, agency, firm or nonprofit. Self-nominations are not permitted. 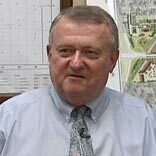 The Groves Award was created in honor of Ken Groves, the late Planning Director of the City of Montgomery, Alabama. His leadership in using land development and planning to create better communities is a gift that he left for all. Through his vision and persistence, Alabama's capital city began its journey back to prominence and sustainability. This year's award will be presented at CNU25.Seattle in May, 2017. Download the Rules and Nomination Form here.